Braun appointed to State Senate, 5th District – Welcome to Wyandotte Daily! Kevin Braun has been appointed to the Kansas Senate, 5th District, seat. Braun is a conservative Republican who lives in the Piper area of Kansas City, Kansas. The 5th District position opened recently with the resignation of State Sen. Steve Fitzgerald, a Republican from Leavenworth. A convention of Republican precinct committeemen and women from the 5th District was held on Thursday, Oct. 18, in Leavenworth, and Braun was elected to fill the Senate seat. The appointment then was made by Gov. Jeff Colyer. The 5th District includes the Piper area, as well as Bonner Springs, parts of western Kansas City, Kansas, Lansing and Leavenworth. When a state senator or representative retires in mid-term, the precinct committeemen and women of the district, of the same party as the officeholder, choose the successor, Braun said. The office next will be up for election in 2020, and “I intend to run,” Braun said. Braun said fiscal responsibility is a key issue for him. Braun, 50, said he will be taking a leave from his commercial operations role in the pharmaceutical industry in the private sector in order to serve in the Senate. He retired from the Army Reserve on Aug. 1, 2018, with the rank of lieutenant colonel, after 32 years of service. Braun is a member of the VFW, American Legion and Knights of Columbus. He holds a bachelor’s degree in business and a master’s degree in business law. Braun said he would have supported whoever won the Republican primary for governor this year. Braun previously ran for the 36th District, state representative position in 2016, and for the Board of Public Utilities, at-large 1st District, in 2017. 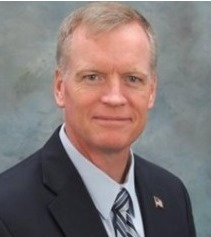 Braun came in third place in the BPU primary in a very close contest with the second-place candidate. Sen. Fitzgerald had run this year in the primary for U.S. representative, 2nd District, which was won by Republican Steve Watkins, who faces Democrat Paul Davis and Libertarian Kelly Standley in the general election. Rep. Lynn Jenkins, R-2nd Dist., is not running for re-election.